Now, this is going to be fun. On Thursday Democratic New York Rep. Alexandria Ocasio-Cortez used Twitter to slam the Times Square billboard that criticized her as ‘wack.’ The Job Creators Network, the organization that put up the first billboard, didn’t respond with a tweet, instead, they put up a set of two new billboards. In response to criticism from Rep. Alexandria Ocasio-Cortez via Twitter on Wednesday and Thursday, the Job Creators Network erected two new billboards at the prominent intersection of 7th Avenue and 42nd Street in Manhattan’s Times Square. The new billboards constructed today by the Job Creators Network poke fun at the tweet, as well as put it into context. 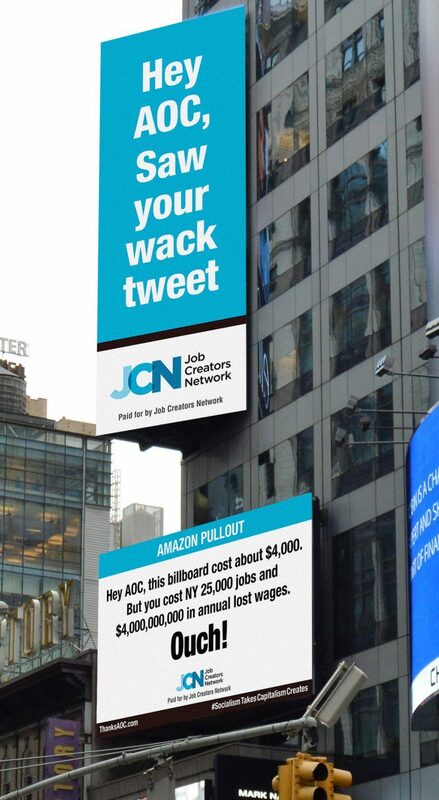 The top billboard states “Hey AOC, Saw your wack tweet.” The second ad, located just below the first, goes on to call attention to the fact that although the billboard costs about $4 thousand, Ocasio-Cortez’s actions contributed to the loss of $4 billion in annual wages for New Yorkers.